I read a story earlier today on Huffington Post about Garden of Eden, described as a small organic farm, being raided by the Arlington, TX SWAT team. The original story was reported on WFAA. At the same time, code enforcement officials executed a warrant to remedy code violations that included blight conditions. They wound up removing 20,420 pounds of materials which they deemed to be a nuisance or hazard. The story caught my attention because one of the violations had to do with uncut grass. Normally, I don't like to talk about political topics on this site. I really don't care what other people do. I know what I like about organic gardening for myself and I choose to share the information I learn and my experiences here. I'm too lazy and uninterested to be any sort of activist but after what I saw I had to ask myself what the heck is going on here? I absolutely understand the need for police to have certain procedures to insure not only their safety, but the safety of suspects when it comes to investigating certain crimes but it seems very suspicious that the drug raid and the code enforcement happened together. The address of Garden of Eden was listed as 7325 Mansfield Cardinal Rd, Kennedale, TX 76060 so I checked Bing Maps to see what Garden of Eden looked like and was pretty surprised with what I found. Depending on how far you zoomed in I got to see what appear to be satellite images that were taken before and after Garden of Eden was established. The images are included later in the post along with some more of my thoughts. It was described as an organic farm but from looking at the satellite imagery below it looks more like a very large garden that is mainly for the residents of the property. The reports indicated 8 adult residents were handcuffed during the raid. From looking at the videos and pictures it looks more like some sort of hippie commune. 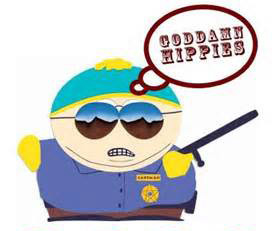 Now, I don't have a solid opinion on hippie communes... On the one hand you have weird dudes with long unwashed hair saying strange things and on the other you have you have cute chicks that don't wear bras and are very touchy-feely. (At least that's what I learned from South Park.) So I'm torn. Like touchy feely chicks, don't like smelly dudes. Either way, I feel people should have a decent amount of freedom to live the way they want as long as they're not hurting anyone. Now on to the satellites. 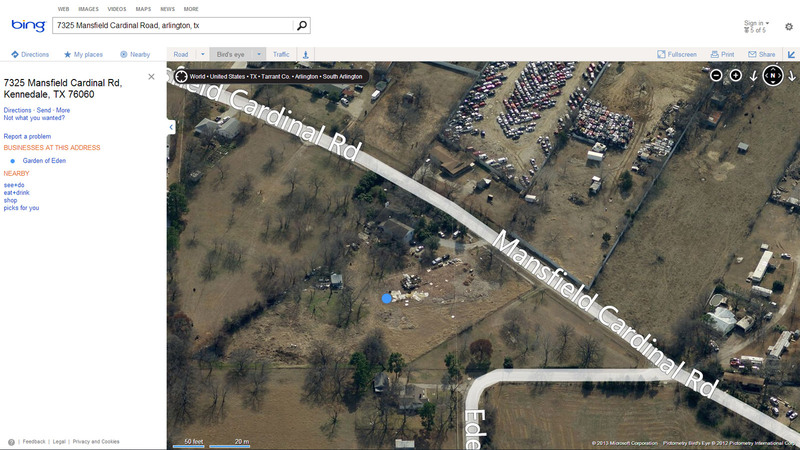 The satellite images from Bing Maps are not real-time. They're taken at different times and at different zoom levels you might get images that were taken at vastly different dates. When zoomed in on the aerial (satellite) view I see the following which appears to be taken before the gardens of Garden of Eden where established. It's Texas and all the lawns in the area have turned brown so this was likely taken in winter where the lawn goes dormant. You can clearly see a lot of "stuff" is now on the property and it sort of looks a bit unkempt. You might be thinking the stinking hippies residents of Garden of Eden got what they deserved... but hold on one minute and let's look at the bigger picture. 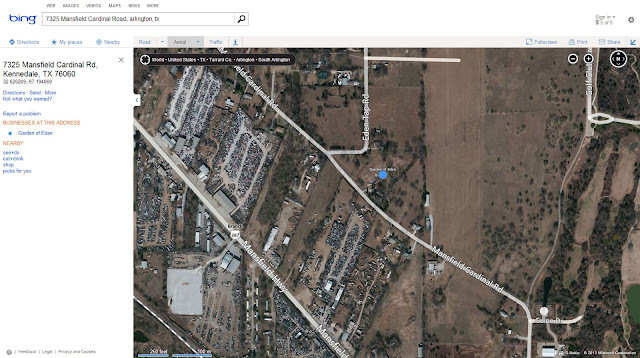 Let's zoom out a little more and see the rest of the neighborhood. Looks like there are a couple of other residential properties but the bulk of the land looks to be industrial and agricultural. There are a number of properties on the other side of the street that have a lot of parked cars. I thought they were very popular malls. ??? 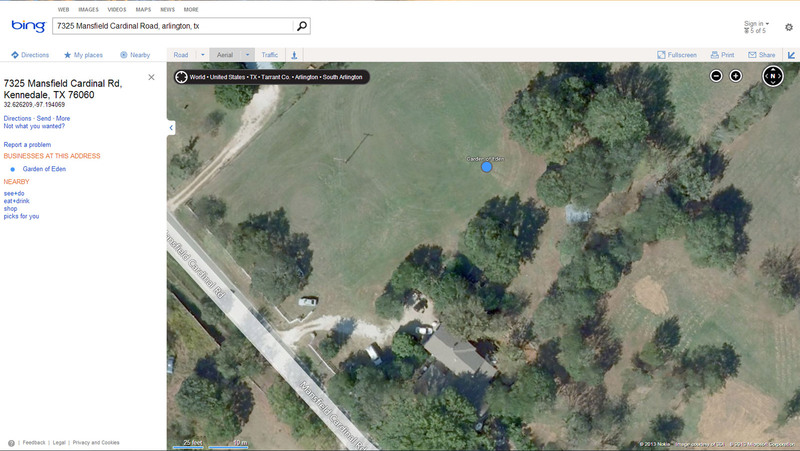 Here's a better view using the Bird's Eye feature. 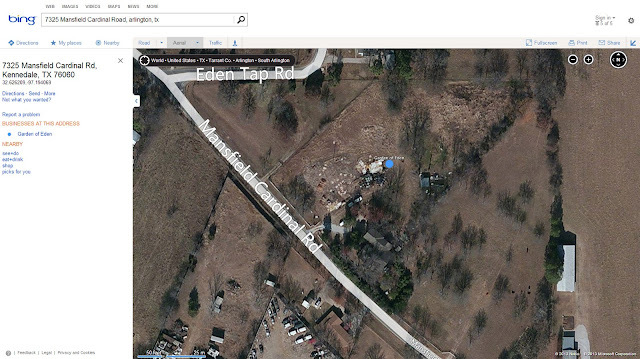 There's more detail of the Garden of Eden and you can clearly see that the two "parking lots" are actually junk yards. Some of the other things I thought were parking lots are too. I see a bunch of boats and other trash too. The garden doesn't look that great. Definitely not as nice as the raised bed I plan to build. :) But I just can't seem to help to ask... Is it that important to remove the "blight" caused by a few messy gardeners in an area that's surrounded by junk yards and farms? The gardens are also well inside the property. It's not like they're right next to the roads or neighbor's properties and the lots are very big. At least compared to lots in my area.